Janine spent some time in New Zealand when she was at school as an exchange student and it was in New Zealand that she learnt to spin wool and also got deeply interested in making pottery, something that has stayed with her for the rest of her life. Another thing that she learnt about in New Zealand was the Edmonds CookBook. She bought, or was given her first copy over there. 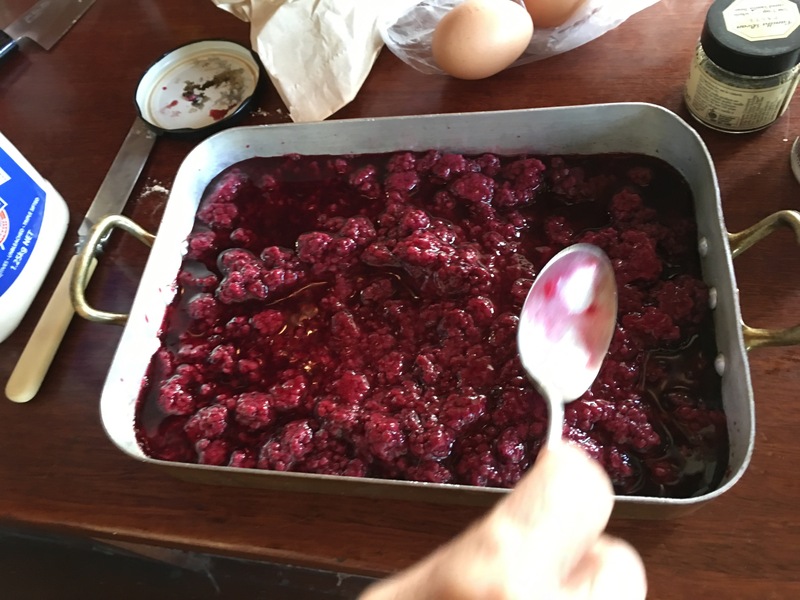 She still uses it or refers to it often, mostly for cakes and puddings. It has been one of the constants in her life. We recently got the latest version, when a relative visited New Zealand last year. I had tried to buy a copy by online direct from Edmonds, It was meant to be a surprise for Janine, but the online option didn’t seem to be available, so I sent an email requesting information on how to buy a copy and have it sent over here to Australia. I filled out the contact info page and waited. Nothing happened for a day or two, then when I was out. A very nice lady from Edmonds rang directly from New Zealand to inform the bewildered Janine that she couldn’t buy one in New Zealand and have it posted out to Australia, but rather, all she had to do was go down to the local ‘Dairy’ and buy a copy herself. The ‘Dairy’ in New Zealand is a bit like a small supermarket or local shop. They are everywhere in New Zealand, but not here in OZ. Janine tried to explain that we don’t have a local ‘Dairy’ here. But the Edmonds Lady wouldn’t have it. She insisted that all Janine had to do was to ask. “They will have it!” “Everybody stocks it!” We don’t see Edmonds baking products for sale here in Australia. At least, not where we live anyway. Janine explained that we live in Australia and that the lady must have dialled ISDN to get through to us in Australia. She must know that we are located in Australia. She told her that we just can’t buy Edmonds Baking Products here. All to no avail. 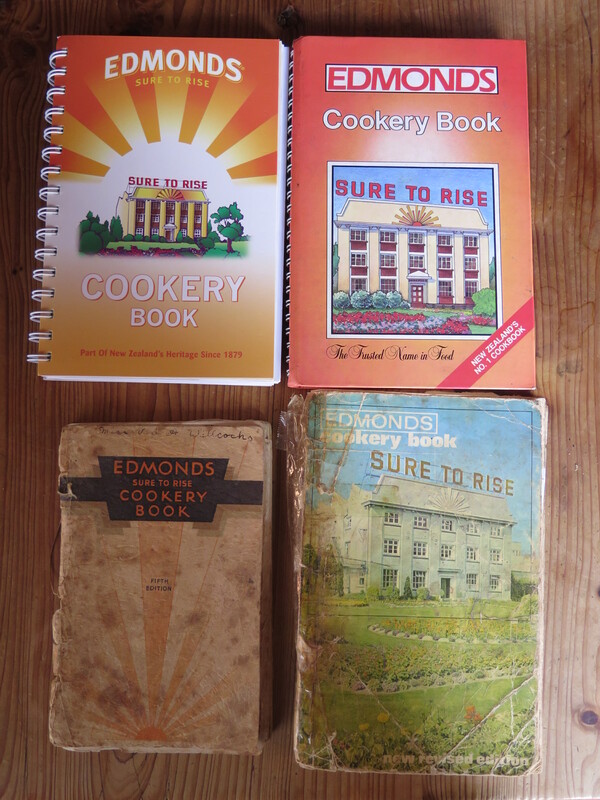 So the surprise was lost and we still didn’t have a new Edmonds cookery book. We laughed about it a lot though, and we do now have 4 editions of about 10 to 15 years apart. When Janine’s relatives turned up here with the intension of travelling on to New Zealand and back again, it was an opportunity not to be missed. We now have our new copy, along with the other 3 older editions. It’s quite interesting to look through them and see what has changed. 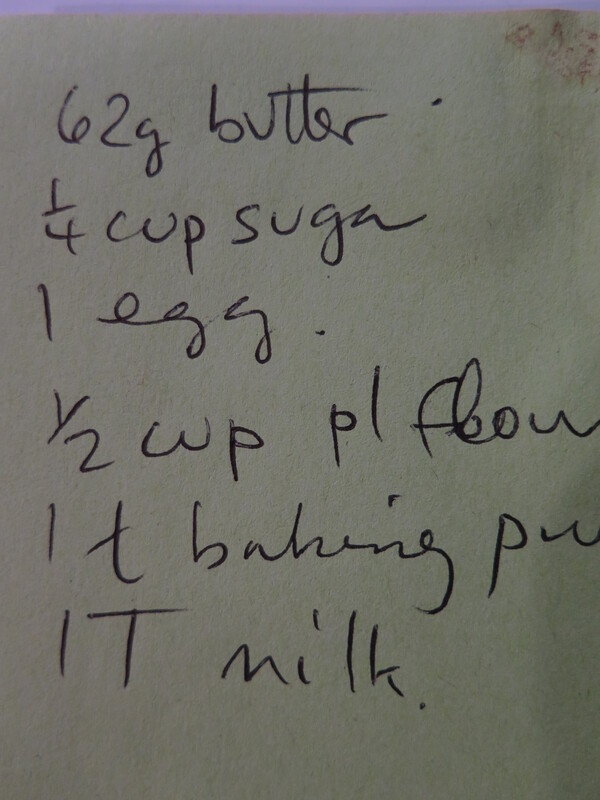 In the 60’s edition, all the recipes are detailed on how to make the item from scratch. The biggest difference between the old copy and the new one is that now it is more likely to say something like, open a can or packet of this or that and add something to it. it’s an interesting record of changes in cooking habits over 50 years. Certainly the latest edition has very much more up-market descriptions of the recipes. One particular recipe that is all the books is the sponge fruit pudding. The name changes a little, but the recipe remains pretty similar. It’s a lovely, warming, comfort food pudding for cold winter nights. 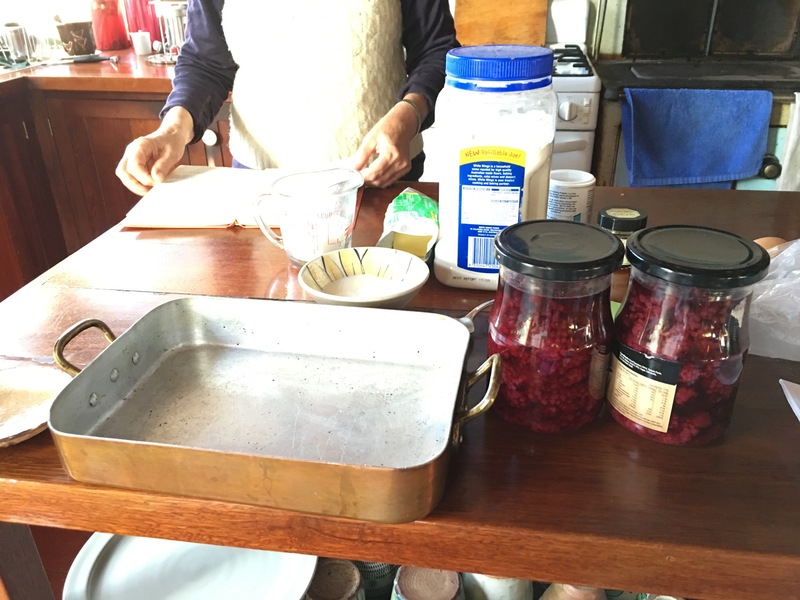 Janine has developed her own particular variation, depending on what is in season or in the preserving cupboard. Tonight it’s preserved young berries that are going into the pud. Take a 750 ml. jar of home made preserved youngberries. Pour into baking dish. 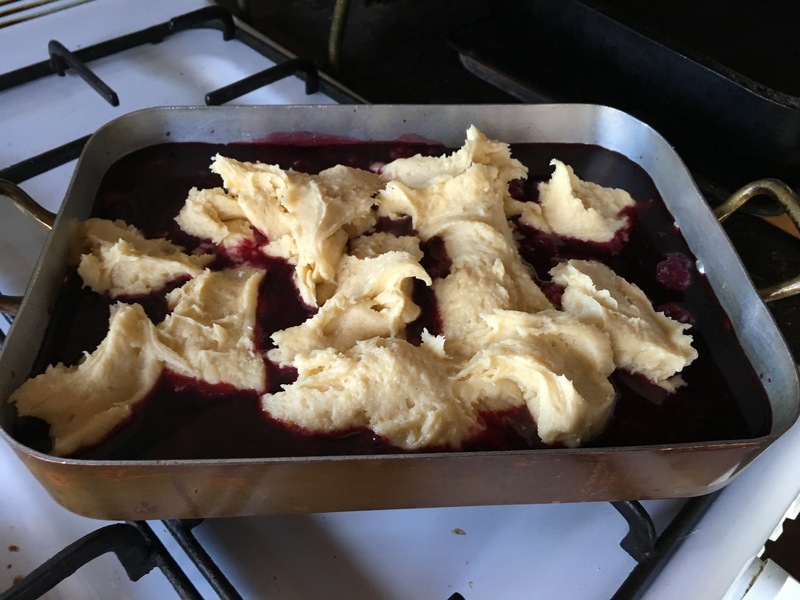 Make a sponge topping as per your favourite Edmonds recipe, spoon it over the cooked fruit and bake until springy and golden. 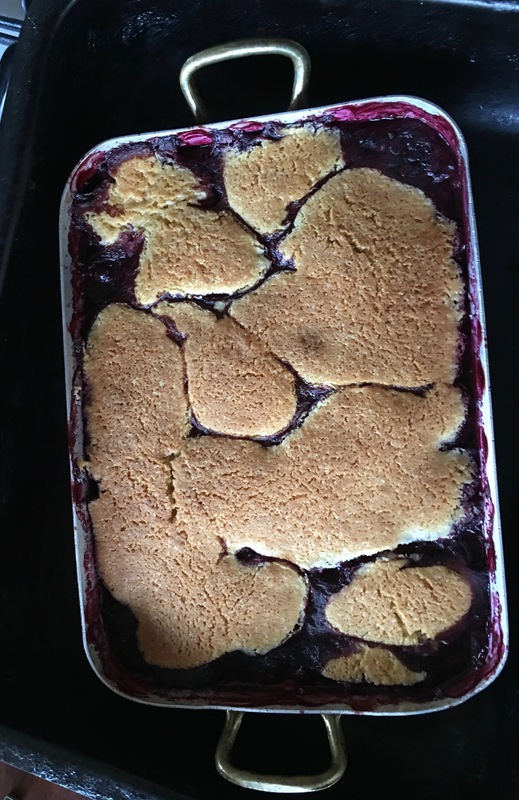 the recipe says from 35 to 45 mins at either 180 or 190oC, but My Sweet is cooking in the wood burning stove, so all the temps are a bit of a guess for us. She knows her stove now after 40 years and gets a wonderful result out of it. Cook until done!